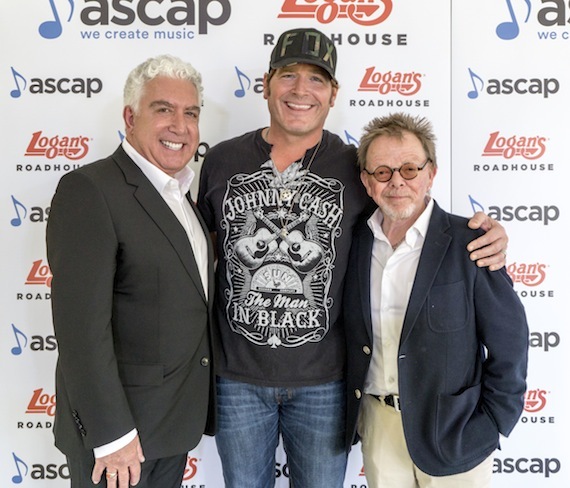 Logan’s Roadhouse CEO Sam Borgese, Jerrod Niemann and ASCAP President and Chairman of the Board Paul Williams. 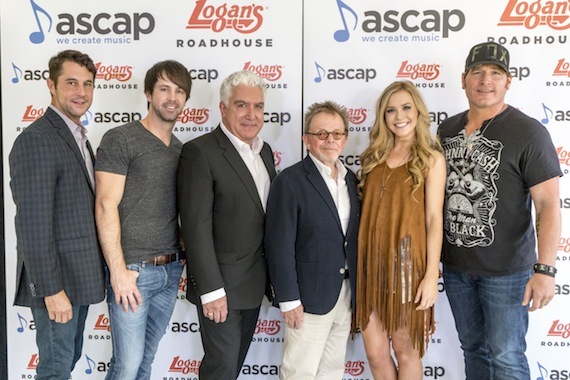 Logan’s Roadhouse and ASCAP are teaming for the Music City Live! tour, kicking off in early summer 2016 as a way to boost emerging singer-songwriters. 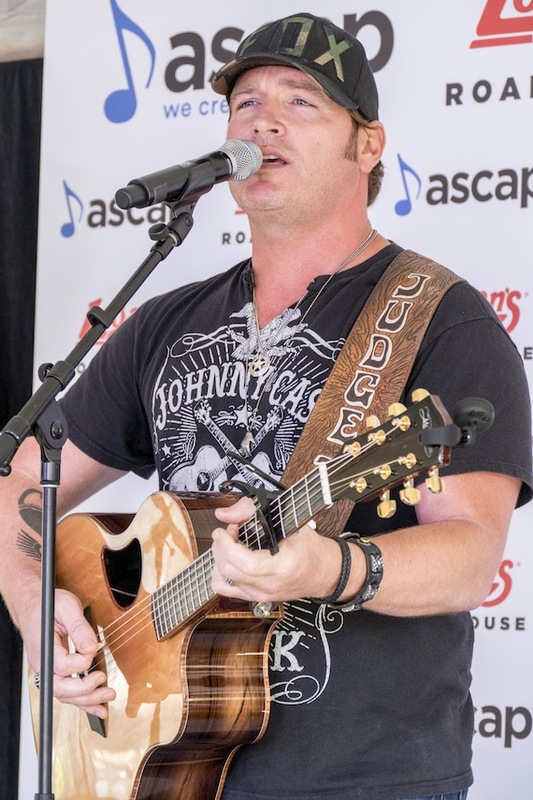 Sea Gayle Music/Arista Nashville recording artist and ASCAP member Jerrod Niemann will be the official spokesperson and mentor to artists on the tour. He performed at today’s press event at Logan’s in Nashville, where the tour was announced by ASCAP President and Chairman Paul Williams and Logan’s Roadhouse CEO Sam Borgese. The Music City Live! tour will visit Logan’s locations nationwide and is part of a larger collaboration between the restaurant company and ASCAP to promote the careers of aspiring songwriter-artists, support music education and more. On Oct. 1, the Logan’s Roadhouse Cool Springs in Franklin, Tenn. will host the restaurant’s first live music showcase featuring emerging artist Chris Cavanaugh. Cavanaugh and Sarahbeth Taite also performed at today’s event. The yet-to-be-announced performers on the upcoming tour will board three Logan’s Roadhouse/ASCAP-branded tour buses and travel to numerous Logan’s Roadhouse locations. Customers will have the opportunity to interact with artists through meet-and-greets, philanthropic events and more. Niemann will appear at select Logan’s Roadhouses to meet fans and participate in local programs that support music education in schools. The emerging artists featured on the tour will be added to ASCAP-curated playlists at all 230 Logan’s Roadhouse locations in October. Williams and Borgese noted that it will create income for emerging artists while allowing them to practice their crafts in a friendly environment. “You learn by doing…. In those ‘gulp’ moments before you get on stage,” said Williams. They also saluted ASCAP’s licensing department for coming up with the idea. Pictured (L-R): ASCAP VP of Nashville Membership Michael Martin, Chris Cavanaugh, Logan’s Roadhouse CEO Sam Borgese, ASCAP President and Chairman of the Board Paul Williams, Sarahbeth Taite and Jerrod Niemann.